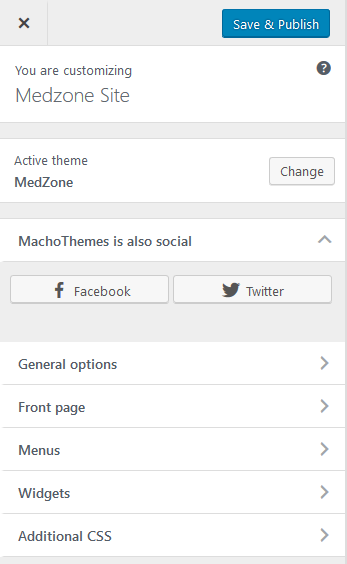 The full flexibility of the Medzone theme is provided through the front end customizer. With this you can easily build up your front page, control the color scheme of your site, adjust the typography setting and much more. To access the customizer you need to navigate to Appearance > Customize in your admin panel. 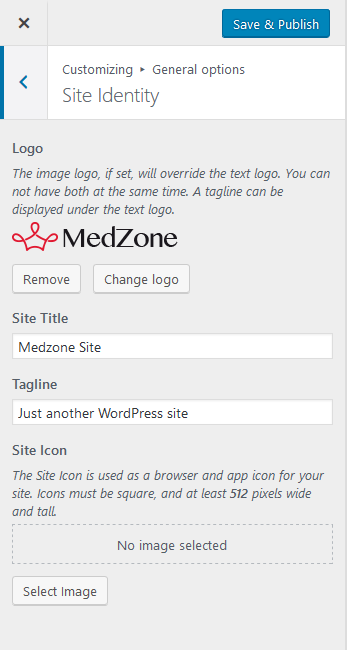 Logo : in the Medzone theme you can choose between an image or a text logo. The text logo is the default option, when uploading an image for this setting the text logo is overwritten by the image. Site Title : when an image logo is not used, this text is used instead. Tagline : this option will allow you to display your company's main goal, ideal. Site Icon : The Site Icon is used as a browser and app icon for your site. Icons must be square, and at least 512 pixels wide and tall. 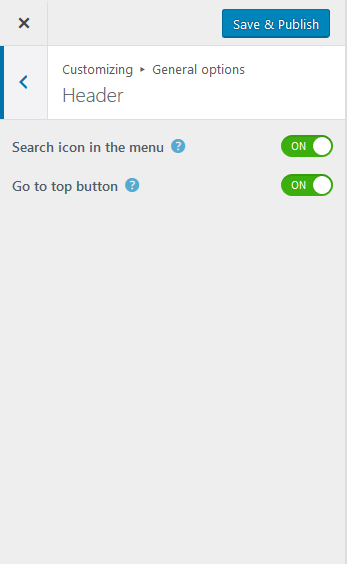 Search icon in the menu : enable or disable an additional search functionality for your site through a search icon next to your menu. Go to top button : enable a button that allows you to quickly scroll back to the top of the page. 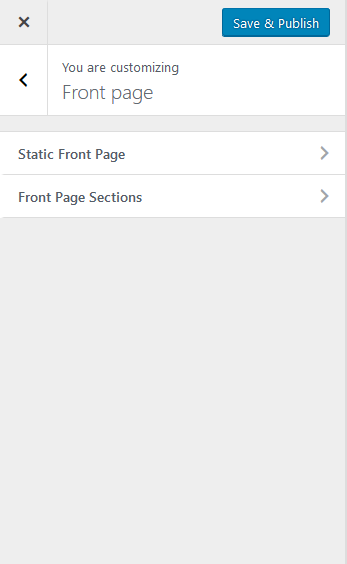 Page Layout : set the layout for the rest of your site pages, similarly with a single or multi column display. 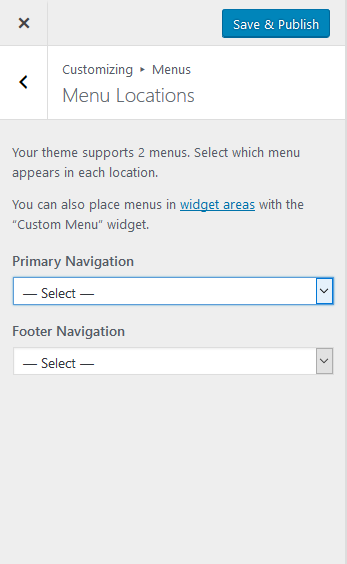 This option also provides the custom width configuration, but only in the Pro version of the theme. Headings : with this you can set the blog headings font, set the text to bold, italic and also control the letter spacing. 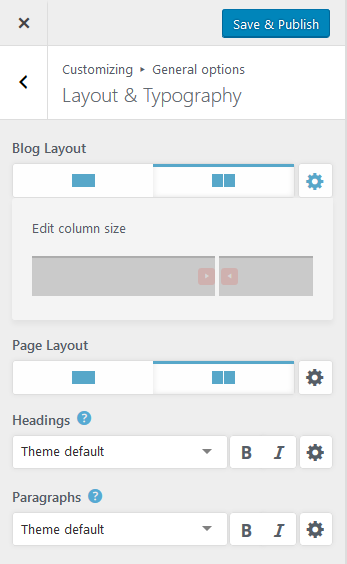 Paragraphs : this will allow you to control the blog paragraphs font, bold,italic settings and also the letter spacing. Current header : set an image for your blog header background. 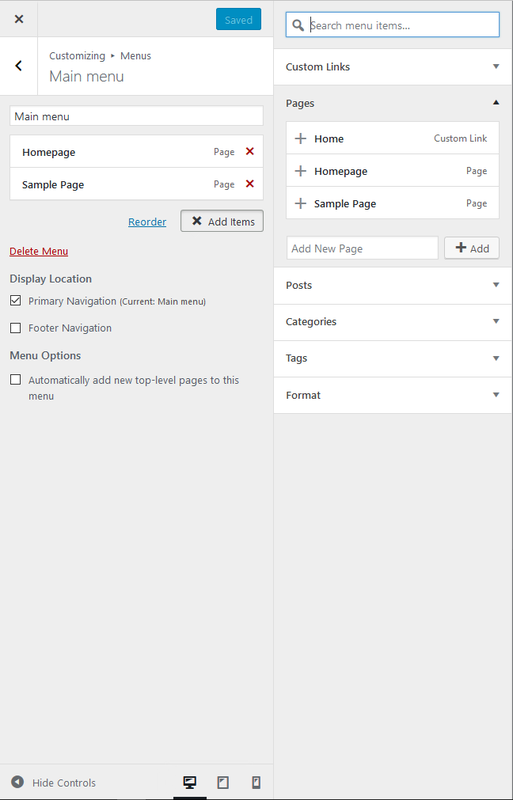 Post Meta Categories : This will disable the category section at the beginning of the post. Post Meta Author : This will show or hide the author information for the displayed post. Post Meta Tags : This will show or hide the tags section at the end of the post. This tab allows you to control the color scheme of your site. You can choose between sets of predefined color packages or define your own using the below options. Accent color #1 : set the main color of the theme. Accent color #2 : set the second main color of the theme. Text color : set the color of your paragraphs. Title color : set the color of your site titles. Contrast color : set the color used for paragraphs in a contrast background. Footer Background color : set the background color of your site footer. Footer Text color : set the color for the footer paragraphs. Footer Copyright Background color : set the background color of the copyright band. 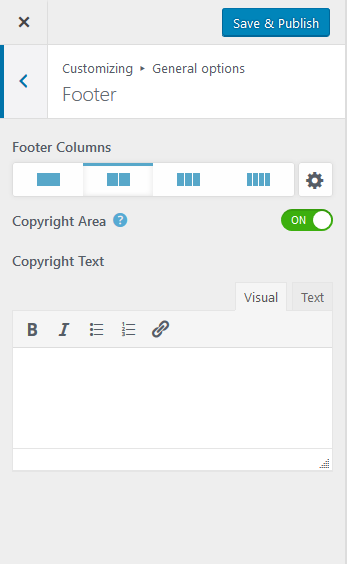 Footer Copyright Text color : set the color of your copyright band paragraphs. 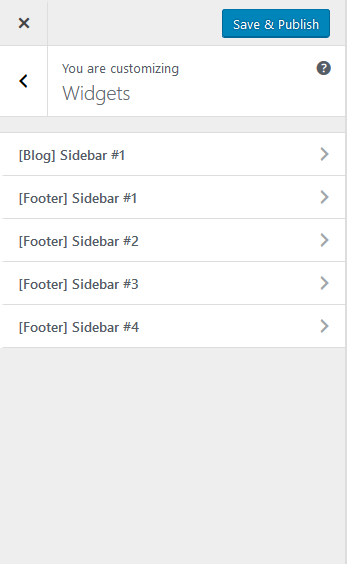 Footer columns : set the number of columns generated in your footer area. Copyright text : the copyright text displayed under the footer. 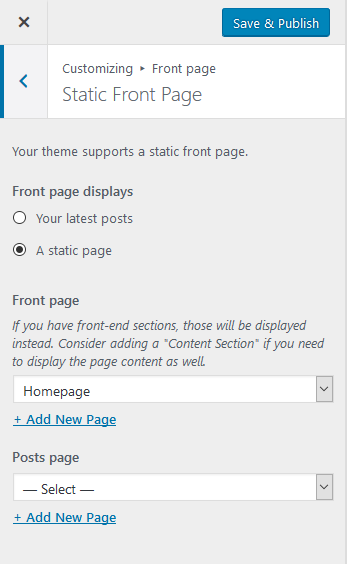 Static Front page : this allows you to choose the front page of your site, similar to the configuration area available in the admin panel Appearance > Reading. Front page sections : the front page of the Medzone theme is rendered through the use of sections. You can edit each one or add extra sections to the current list. The actual sections available will be presented in separate articles. 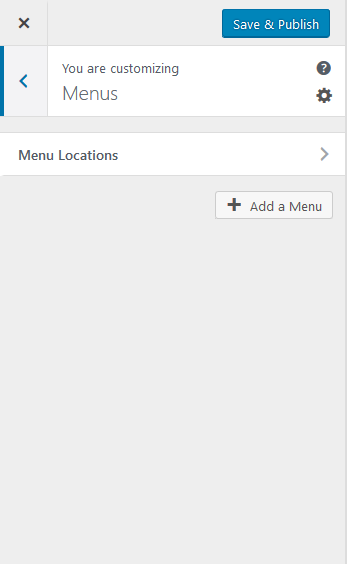 The menu is the primary navigation method available in your site, you can create any number of menus with the help of the `Add menu` button. Recent Posts : as the name suggests this will display a list of your most recent posts in your configured widget area. 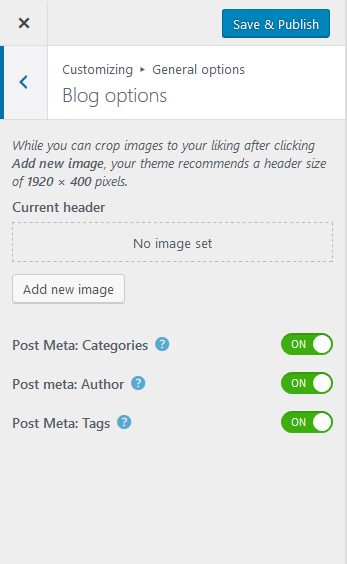 This widget is different from the default WordPress `Recent post` widget, it displays the post thumbnail/image as well. Feature doctors : this will display the main star of your doctors team. 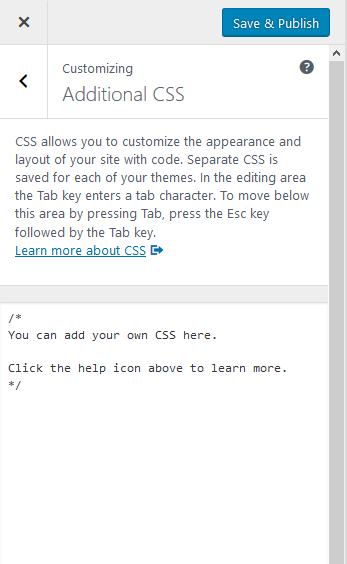 In this section you can add custom CSS definitions that will further style your page elements.